Nature has such an abundance of colours and flavours, textures and scents which are there for us to discover. A balanced diet must include fresh fruit and vegetables and with a rainbow of colours to choose from there are lots of exciting ways to introduce new flavours and tastes when weaning your baby. 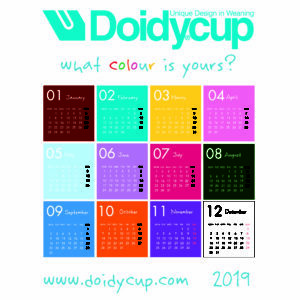 Just like nature, Doidy Cup has a wide range of 17 colours to choose from. Visit our Doidy Cup of the Month page to find ideas for this month’s favourite colour and food ideas. Click on the image to download our colour chart which doubles as a 2019 calendar.